"Levi's" redirects here. For other uses, see Levi (disambiguation) and Levis (disambiguation). Levi Strauss & Co. /ˌliːvaɪ ˈstraʊs/ is an American clothing company known worldwide for its Levi's /ˌliːvaɪz/ brand of denim jeans. It was founded in May 1853 when German immigrant Levi Strauss came from Buttenheim, Bavaria, to San Francisco, California to open a west coast branch of his brothers' New York dry goods business. Today's Levi's are made overseas, and there is only one line of jeans made in the US, in Greensboro, NC. 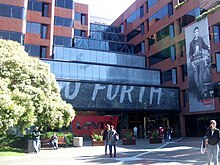 The company's corporate headquarters is located in the Levi's Plaza in San Francisco. Levi's, Dockers, Denizen, Signature by Levi Strauss & Co.
Levi Strauss started the business at the 90 Sacramento Street address in San Francisco and then moved the location to 62 Sacramento Street. In 1858, the company was listed as Strauss, Levi (David Stern & Lewis Strauss) importers clothing etc. 63 & 65 Sacramento St. (Today, on the current grounds of the 353 Sacramento street Lobby ) in the San Francisco Directory with Strauss serving as its sales manager and his brother-in-law, David Stern, as its manager. Jacob Davis, a Latvian Jewish immigrant, was a Reno, Nevada tailor who frequently purchased bolts of cloth made from denim from Levi Strauss & Co.'s wholesale house. After one of Davis' customers kept purchasing cloth to reinforce torn pants, he had an idea to use copper rivets to reinforce the points of strain, such as on the pocket corners and at the base of the button fly. Davis did not have the required money to purchase a patent, so he wrote to Strauss suggesting that they go into business together. After Levi accepted Jacob's offer, on May 20, 1873, the two men received U.S. Patent 139,121 from the United States Patent and Trademark Office. The patented rivet was later incorporated into the company's jean design and advertisements. Contrary to an advertising campaign suggesting that Levi Strauss sold his first jeans to gold miners during the California Gold Rush (which peaked in 1849), the manufacturing of denim overalls only began in the 1870s. The company created their first pair of Levi's 501 Jeans in the 1890s. Modern jeans began to appear in the 1920s, but sales were largely confined to the working people of the western United States, such as cowboys, lumberjacks, and railroad workers. Levi’s jeans apparently were first introduced to the East during the dude ranch craze of the 1930s, when vacationing Easterners returned home with tales (and usually examples) of the hard-wearing pants with rivets. Another boost came in World War II, when blue jeans were declared an essential commodity and were sold only to people engaged in defense work. Between the 1950s and 1980s, Levi's jeans became popular among a wide range of youth subcultures, including greasers, mods, rockers, and hippies. Levi's popular shrink-to-fit 501s were sold in a unique sizing arrangement; the indicated size referred to the size of the jeans prior to shrinking, and the shrinkage was substantial. The company still produces these unshrunk, uniquely sized jeans, and they are still Levi's number one selling product. Although popular lore (abetted by company marketing) holds that the original design remains unaltered, this is not the case: the crotch rivet and waist cinch were removed during World War II to conform to War Production Board requirements to conserve metal, and was not replaced after the war. Additionally, the back pocket rivets, which had been covered in denim since 1937, were removed completely in the 1950s due to complaints they scratched furniture. From the early 1960s through the mid-1970s, Levi Strauss experienced significant growth in its business as the more casual look of the 1960s and 1970s ushered in the "blue jeans craze" and served as a catalyst for the brand. Levi's, under the leadership of Walter Haas, Peter Haas Sr., Paul Glasco and George P. Simpkins Sr., expanded the firm's clothing line by adding new fashions and models, including stone-washed jeans through the acquisition of Great Western Garment Company (GWG), a Canadian clothing manufacturer acquired by Levi's. 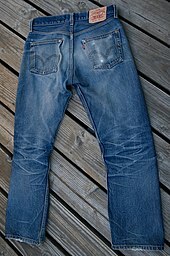 The acquisition led to the introduction of the modern "stone washing" technique, still in use by Levi Strauss. Simpkins is credited with the company's record-paced expansion of its manufacturing capacity from 16 plants to more than 63 plants in the United States from 1964 to 1974 and 23 overseas. Levi's' expansion under Simpkins was accomplished without a single unionized employee as a result of Levi's' and the Haas family's strong stance on human rights and Simpkins' use of "pay for performance" manufacturing from the sewing machine operator level up. As a result, Levi's' plants were voted the highest performing, best organized and cleanest textile facilities of their time. From a company with fifteen salespeople, two plants, and almost no business east of the Mississippi in 1946, the organization grew in thirty years to include a sales force of more than 22,000, with 50 plants and offices in 35 countries. In the 1980s, The company closed around 60 of its manufacturing plants because of financial difficulties and strong competition from competitors. The Dockers brand, launched in 1986 and which is sold largely through department store chains, helped the company grow through the mid-1990s, as denim sales began to fade. Dockers were introduced into Europe in 1996 and led by CEO Jorge Bardina. Levi Strauss attempted to sell the Dockers division in 2004 to relieve part of the company's $2.6 billion outstanding debt. By the 1990s, Levi's faced competition from other brands and cheaper products from overseas, and began accelerating the pace of its US factory-closures and its use of offshore subcontracting agreements. In 1991, Levi Strauss became implicated in a scandal involving pants made in the Northern Mariana Islands: some 3% of Levi's jeans sold annually with the Made in the USA label were shown[by whom?] to have been made by Chinese laborers under what the United States Department of Labor called "slavelike" conditions. As of 2016[update], most Levi's jeans are made outside the US, though a few of the higher-end, more expensive styles are still made in the U.S.
Cited for sub-minimum wages, seven-day work weeks with 12-hour shifts, poor living conditions and other indignities, Tan Holdings Corporation, Levi Strauss' Marianas subcontractor, paid what were then the largest fines in U.S. labor history, distributing more than $9 million in restitution to some 1,200 employees. Levi Strauss claimed no knowledge of the offenses, then severed ties to the Tan family and instituted labor reforms and inspection practices in its offshore facilities. The activist group Fuerza Unida (United Force) formed following the January 1990 closure of a plant in San Antonio, Texas, in which 1,150 seamstresses, some of whom had worked for Levi Strauss for decades, saw their jobs exported to Costa Rica. During the mid- and late-1990s, Fuerza Unida picketed the Levi Strauss headquarters in San Francisco and staged hunger strikes and sit-ins in protest at the company's labor policies. The company took on multibillion-dollar debt in February 1996 to help finance a series of leveraged stock buyouts among family members. Shares in Levi Strauss stock are not publicly traded; the firm as of 2016[update] is owned almost entirely by indirect descendants and collateral relatives of Levi Strauss, whose four nephews inherited the San Francisco dry-goods firm after their uncle's death in 1902. The corporation's bonds are traded publicly, as are shares of the company's Japanese affiliate, Levi Strauss Japan K.K. In June 1996, the company offered to pay its workers an unusual dividend of up to $750 million in six years' time, having halted an employee-stock plan at the time of the internal family buyout. However, the company failed to make cash-flow targets, and no worker dividends were paid. The annual sales of the brand increased in 1997 to reach $7.1 billion. In 2002, Levi Strauss began a close business collaboration with Walmart, producing a special line of "Signature" jeans and other clothes for exclusive sale in Walmart stores until 2006. Levi Strauss leads the apparel industry in trademark infringement cases, filing nearly 100 lawsuits against competitors since 2001. Most cases center on the alleged imitation of Levi's back pocket double arc stitching pattern (U.S. trademark #1,139,254), which Levi filed for trademark in 1978. Levi's has successfully sued Guess, Polo Ralph Lauren, Esprit Holdings, Zegna, Zumiez, and Lucky Brand Jeans, among other companies. In 2002, the company closed its Valencia Street plant in San Francisco, which had opened the same year of the city's April 1906 earthquake. By the end of 2003, the closure of Levi's last U.S. factory in San Antonio ended 150 years of jeans made in the USA. Production of a few higher-end, more expensive styles of jeans resumed in the US several years later. By 2007, Levi Strauss was again profitable after declining sales in nine of the previous ten years. Its total annual sales, of just over $4 billion, were $3 billion less than during its peak performance in the mid-1990s. After more than two decades of family ownership, rumors of a possible public stock offering were floated[by whom?] in the media in July 2007. In 2009, it was noted[by whom?] in the media for selling jeans on interest-free credit, due to the global recession. In 2010, the company partnered with Filson, an outdoor-goods manufacturer in Seattle, to produce a high-end line of jackets and workwear. In 2011, the firm hired Chip Bergh as the president and chief executive of the brand. On May 8, 2013, the NFL's San Francisco 49ers announced that Levi Strauss & Co. had purchased the naming rights to their new stadium in Santa Clara, California. The naming-rights deal called for Levi's to pay $220.3 million to the city of Santa Clara and to the 49ers over twenty years, with an option to extend the deal for another five years for around $75 million. As of 2016[update], Levi Strauss Signature jeans are sold in 110 countries. In 2016, the company reported revenues of $4.6 billion. In 2017, Levi Strauss & Co. released a "smart jacket", an apparel they developed in partnership with Google. After two years of collaboration, the result was a denim jacket set at $350. In March 2019 Levi's debut on the New York Stock Exchange under the ticker “LEVI”. Levi Strauss valued at $6.6 billion as IPO prices above target. In 2020, Levi Strauss & Co. are expected to have completely replaced chemical usage to lasers in order to cut and design ripped parts of jeans. Levi's has been worn by people from all walks of life, from miners to actors to Nobel Prize recipients, from Marlon Brando to Albert Einstein himself, whose leather jacket was made by Levi Strauss & Co in the 1930s and sold at auction house Christies in July 2016 for £110,500. Levi Strauss & Co. is a worldwide corporation organized into three geographic divisions: Levi Strauss Americas (LSA), headquartered in San Francisco; Levi Strauss Europe (LSE), based in Brussels; and Levi Strauss Asia Pacific, Middle East and Africa (LSAMA), based in Singapore. The company employs a staff of approximately 16,000 people worldwide. Levi Strauss first went public in 1971 after many decades of family ownership. However, in 1985 the descendants of Levi Strauss recaptured ownership of the company, taking it private once again for the next 34 years. ,  In February 2019, the company filed with the U.S. Securities and Exchange Commission for an initial public offering, to be traded on the New York Stock Exchange under the ticker symbol LEVI. Levi Strauss went public for the second time in its history on March 21, 2019 at a price of $17 per share. The company is also well-known for promoting progressive causes. They were one of the earliest private sector institutions to support LGBTQ causes, and came out against the presidency of Donald J. Trump by donating $1 million to support immigration and LGBTQ rights. In 2018, CEO Chip Bergh published an Op-ed in Fortune magazine endorsing gun control. Products include jeans, trousers, shorts, shirts, jackets, sweaters, T-shirts, underwear, socks, eyeglasses, accessories, shoes, dresses, skirts, belts, overalls, jumpsuits and a "big and tall" range. Jeans are categorised by fit as: skinny, slim, straight, bootcut, taper, relaxed, flare and big & tall. Most of the adult denim jeans are identifiable by trademarked three digit style numbers. 501s are available in styles for both men and women, the rest of the 500 series are marketed for men and the 300, 400, 700, and 800 series for women, with the exception of 751s which are classic straight zip fly jeans. ^ "Levi Strauss & Co. Announces Fourth-Quarter & Fiscal-Year 2013 Financial Results" (PDF) (Press release). Levi Strauss. February 11, 2014. Retrieved March 11, 2016. ^ a b "Levi Strauss & Co". Forbes. Retrieved May 22, 2014. ^ "Executive Profile: Stephen C. Neal". bloomberg.com. Bloomberg LP. February 20, 2019. Retrieved February 20, 2019. ^ a b c d e "2018Form 10-K" (PDF). ^ "Levi Strauss & Co. Celebrates 150th Anniversary". PR Newswire (Press release). May 1, 2003. Retrieved February 1, 2017. ^ Duxbury, Sarah (July 13, 2009). "Levi Strauss to stay put in San Francisco". San Francisco Business Times. Retrieved March 7, 2012. ^ "David Stern & His Sons: Prime Movers of Levi Strauss & Co". Jewish Museum of the American West. Retrieved April 17, 2018. ^ Rocha, Guy (September 1999). "Levi' 501 jeans: a riveting story in early Reno". Nevada Archives. Archived from the original on March 5, 2012. ^ "Levi pants invented in Reno, Nevada". Sierra Sage, Carson City/Carson Valley, Nevada. March 1999. Archived from the original on March 5, 2012. Retrieved March 7, 2018 – via State of Nevada Archives. ^ "History of Jeans and Denim". History of Fashion. 2015-01-17. Retrieved 2017-06-12. ^ "History of The Levi's 501 Jeans" (PDF). Retrieved March 11, 2016. ^ "Our Story". levistrauss.com. Retrieved March 7, 2018. ^ "Levi Strauss & Co. | American company". Encyclopedia Britannica. Retrieved 2017-06-12. ^ "The island that lost its shirts". Thestandard.com.hk. Archived from the original on February 9, 2009. Retrieved March 16, 2010. ^ Shenon, Philip (July 18, 1993). "The New York Times; July 18, 1993: Made in the U.S.A.? Hard Labor on a Pacific Island/A special report. ; Saipan Sweatshops Are No American Dream". House.gov. Retrieved March 16, 2010. ^ "Fuerza Unida". Inmotionmagazine.com. Retrieved March 16, 2010. ^ "Fuerza Unida, Mujer a Mujer: Firsthand Account of Levi's". Hartford-hwp.com. Retrieved March 16, 2010. ^ "Levi Strauss & Co. – Financials". LeviStrauss.com. Archived from the original on March 26, 2010. Retrieved March 16, 2010. ^ Sterngold, James (June 13, 1996). "Levi Strauss Offers To Pay A Dividend To Workers". The New York Times. ^ Hotten, Russell (2017-09-25). "How jeans giant Levi Strauss got its mojo back". BBC News. Retrieved 2017-10-03. ^ Girard, Kim (July 15, 2003). "Supply Chain Partnerships: How Levi's Got Its Jeans into Wal-Mart". CIO.com. Retrieved March 16, 2010. ^ a b Barbaro, Michael; Creswell, Julie (January 29, 2007). "Levi's Turns to Suing Its Rivals". The New York Times. Retrieved September 27, 2015. ^ "Latest Status Info". Tarr.uspto.gov. Retrieved March 16, 2010. ^ Strasburg, Jenny (April 9, 2002). "Levi Strauss buttoning up its S.F. operations / Valencia Street factory to close by summer". San Francisco Chronicle. Retrieved May 22, 2014. ^ a b c "Levi's set to close last U.S. factory". The Baltimore Sun. New York Times News Service. October 19, 2003. Retrieved May 22, 2014. ^ "Levi Strauss closes last two U.S. plants". Lewiston Morning Tribune. (Idaho). Associated Press. January 11, 2004. p. 2E. ^ "Levi Strauss profit up; Home Depot lowers outlook". San Jose Mercury News. Associated Press. July 11, 2007. Retrieved January 10, 2017. ^ "Levi Strauss earnings rise 61% in 1st quarter". The Los Angeles Times. August 26, 1985. Archived from the original on February 6, 2009. Retrieved March 16, 2010. ^ "Levi's jeans lures Indians shoppers with credit plan". Taipeitimes.com. August 31, 2009. Retrieved March 11, 2016. ^ "Easier said than done". Economist.com. April 15, 2010. Retrieved March 11, 2016. ^ "Filson signs clothing deal with Levi's". Puget Sound Business Journal. August 3, 2010. Retrieved April 21, 2012. ^ "Chip Bergh - Levi Strauss". Levi Strauss. Retrieved 2017-10-03. ^ a b c Loeb, Walter. "How The Retail Industry Can Learn From Levi Strauss' Transformation". Forbes. Retrieved 2017-10-03. ^ Rosenberg, Mike (May 8, 2013). "Levi's Stadium: 49ers' new Santa Clara home gets a name in $220 million deal". San Jose Mercury News. Retrieved May 8, 2013. ^ "Bill Goldman, 38, historian, philanthropist and Levi Strauss heir, killed in plane crash". Jewish Telegraphic Agency. Jul 14, 2017. ^ 90210, HAL (2017-09-26). "Jacquard: Google and Levi's 'smart jacket' that you can only wash 10 times". The Guardian. ISSN 0261-3077. Retrieved 2017-10-03. ^ "Levi Strauss valued at $6.6 billion as IPO prices above target". Reuters. 2019-03-21. Retrieved 2019-03-21. ^ "Einstein's Levis Jacket Sold For Over £100k". Stuarts London. ^ "Levi Strauss & Co Timeline" (PDF). ^ Lucas, Amelia (February 13, 2019). "Levi Strauss plans to go public — again. Files IPO under symbol LEVI". CNBC. Retrieved February 13, 2019. ^ Levi Strauss & Co. (February 13, 2019). "Form S-1: Registration Statement under the Securities Act of 1933". EDGAR. U.S. Securities and Exchange Commission. Retrieved February 13, 2019. ^ Bergh, Chip. "Why Business Leaders Need to Take a Stand on Gun Violence". Fortune. Retrieved 8 April 2019. ^ "Levi Strauss.com". Retrieved June 18, 2016. Ford, Carin T. (2004). Levi Strauss: The Man Behind Blue Jeans (Famous Inventors). Enslow Publishers. ISBN 0-7660-2249-8. Van Steenwyk, Elizabeth (1988). Levi Strauss: The Blue Jeans Man. Walker. ISBN 0-8027-6795-8. Cray, Ed (1978). Levi's: The Shrink to Fit business that stretched to cover the world. Houghton Mifflin Company. ISBN 0-395-26477-4. 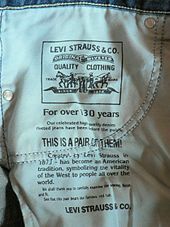 Wikimedia Commons has media related to Levi Strauss & Co..